Weather for today started bright and sunny but soon clouded over and was fairly chilly at 14C. 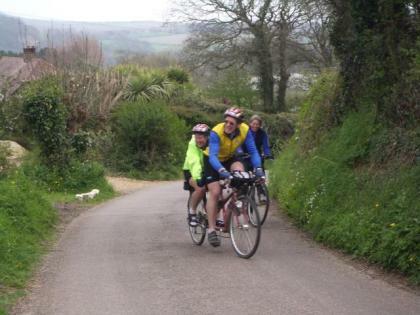 8 of us started off from our Hotel in Ventnor and we rode west along the clifftop road to the control point at Whitwell where we started the Round the Island Randonee. The group fragmented a little as we followed the well signposted route each at our own pace. John was off the front chased by Sam. 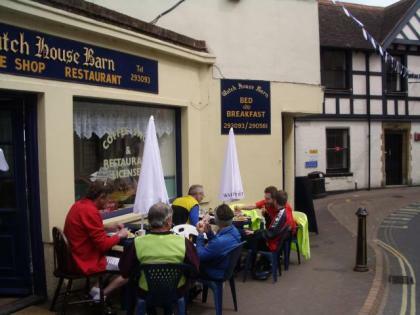 We regrouped at Yarmouth for elevenses with substantial amounts of food piled high for an expected 1000 plus horde of hungry cyclists over the day. We started at the nearest control point to Yarmouth so got to the food first. We stopped at a cafe in Cowes for lunch where we again all regrouped. 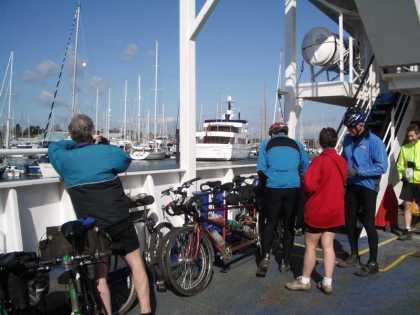 Then on over the chain ferry filled with cyclists and lanes across to Bembridge for tea at the control point. 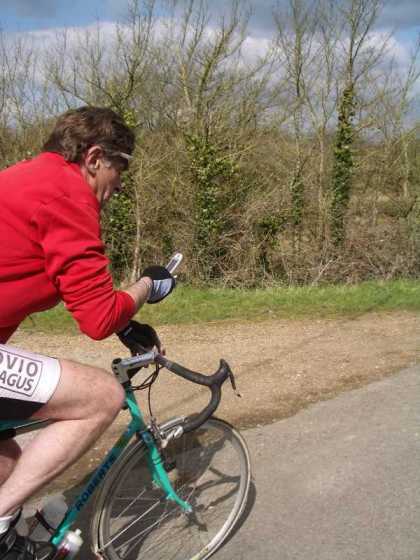 I took it easy for the last section back to Whitwell staying with the 2 Richards. Sam was still trying to keep up with John and sorely regretting it. The round the Island route was 66 miles with 3800ft of climbing. Our total distance for the day was 72.4 miles. Saturday 29 April. Isle of Wight Weekend. 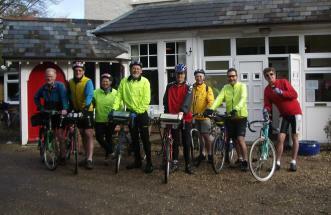 7 of us met at Chichester Cross to ride to Portsmouth for the ferry to the Isle of Wight. Myself, Phil and Mary, Sam, Richard Carlisle, Richard Boulton and John Maxim. We took the usual lanes via Westbourne to stop for an early elevenses in Havant where Jim Jennings joined us. Then on to Portsmouth taking the cycle route into the city from Cosham. We caught the 12.00 car ferry to Fishbourne getting on before all the car drivers and getting to the onboard cafe first with John there ahead of everybody. Lunch was taken at Havenstreet steam Railway cafe with some steam engine sightseeing. Soon afterwards we met 3 members of Brighton DA who planned to stay at Shanklin. We took a narrow lane down to Newport and then the new cyclepath on the old railway toward Sandown. We turned off this after 4 miles and then down on lanes to Godshill for tea. 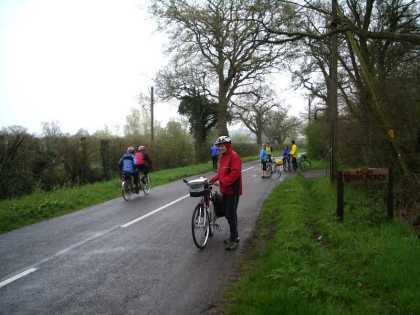 Then more lanes via Wroxall where I had a puncture. Phil assisted with his super grip ripping the tyre off without tyre levers. Then on to Ventnor and our base for the weekend at the Hillside Hotel where we were welcomed with tea in the Conservatory with great views down to the Channnel. A gloriously hot and sunny morning steadily deteriorated throughout the day to bring a cold damp and dark evening with a few spots of rain and worse threatened. No surprise then that only myself and John (R ) met at the start point for this ride. We waited a while and debated whether or not to proceed. Eventually we set off in the general direction of Crockerhill but I pulled up just north of Bersted with a front puncture. At this point we decided to cut our losses and went our separate ways. The ride was abandoned for the evening. Wednesday 19 April. Evening ride to Elmer. By tradition, the Tour of Bognor inaugurates the seasonal evening rides programme, and today’s kicked off in fine style with excellent weather and 8 riders. 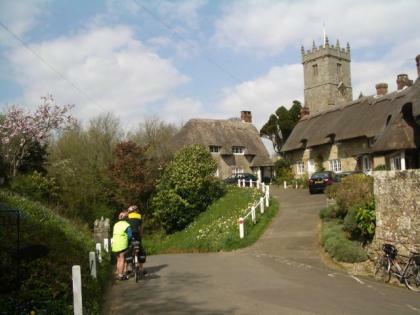 The route was Felpham to Elmer, a distance of just under 3 miles as the crow flies – this being a tour however, we had managed almost 12 by the time the ride ended. The complex route weaved around the back streets of Bognor with opportunites to admire a few regency buildings, a few “blue plaques”, plenty of back alleys, and a few back gardens! Our destination, reached via Ancton, was “The Elmer”, which appeared to have been completely re-furbished in honour of our ride. We returned back in darkness to Felpham, by the direct route this time, in the hope that the fine weather will bode well for the remainder of the evening runs programme.